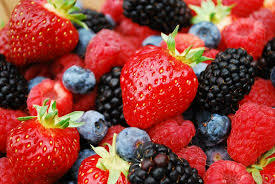 We have an unbelievable amount of recipes for summer berries this week! Finally, the warm weather is upon us! Planting in our gardens, going to the farmer's markets and enjoying what is just the beginning of all good things summer! I'm looking forward to making pickles, jams and of course, my simple pleasure - the first tomato sandwich from the garden! 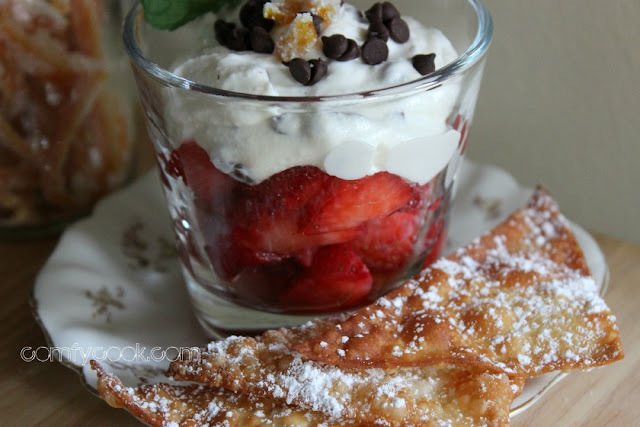 My recipe for Strawberries with Cannoli Cream was given to me by a co-worker when my kids were in grade school. You can make it as a parfait with crushed Amaretti cookies, serve it as a cool dip, or just with strawberries in small dessert cups. There are over 45 recipes today! - who needs a cookbook? Enjoy! Place ricotta, confectioner's sugar, vanilla. cinnamon and liqueur in a food processor and process until smooth. In a medium bowl, whip cream to soft peaks. Fold in ricotta mixture and chocolate chips. Chill until ready to serve. In a medium skillet, heat 1/4 cup oil until shimmering. Cut wontons in half to make triangles. Fry about 30 seconds on each side until lightly browned. Transfer to paper towel. When cool, sprinkle with confectioner's sugar. Fill dessert cups halfway with chopped strawberries. Top with cannoli cream and garnish with chocolate chips and candied orange peel. 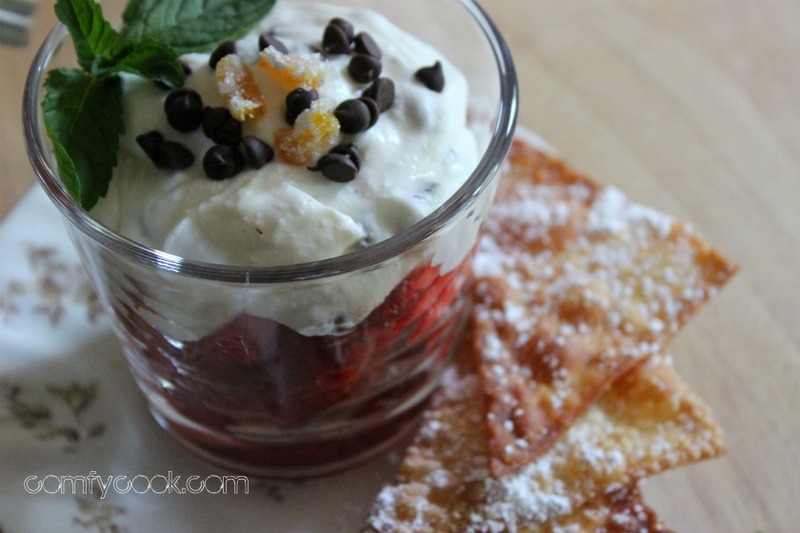 Serve with "cannoli" chips. Enter your favorite photo Foodie BlogRoll Recipe Photo Contest! I've just entered the Foodie BlogRoll Recipe Photo Contest! Click HERE to vote for my photo!! We'd love if you joined our #SundaySupper chat on Twitter too: we’ll tweet throughout the day and share all of our recipes. Then at 7:00pm EST we'll start our weekly chat. Please jump in anytime and join us! To join in, just follow the #SundaySupper hashtag, and remember to include it in your tweets. You can also check out our #SundaySupper Pinterest board for more delicious recipes and photos. PS-For some reason you posts aren't showing up in my Reader so I've missed some, the potato salad sounds great too! I believe I just found THE dessert for my anniversary coming soon. My husband loves a cannoli and strawberries. What a great twist to the dessert. Awesome. Love the presentation of this with the wonton chips! Looks delicious, cannoli cream Yummy! Ok, now this is my kind of dessert! I LOVE cannolis, and I already know I'd love this deconstructed version! Oh wow, Patricia, this dessert looks amazing! From the ricotta and the orange liqueur to those creative won ton wrapper crunchies! Love it! ANd another fun way to use wonton wrappers, too! I love this creative way to eat strawberries. YES YES YES and PLEASE! :) Gorgeous! Could you pass that through please with a big 'ol spoon!! YUM!! Whoa - my stepfam would be all over this, they love their cannoli! This is such a creative dessert and it looks amazing. The won ton wrappers would go great with the cannoli cream YUM! You know, there is nothing I love more in life than a good cannoli and I think I may have to make this over the weekend. Thank you for sharing this one! Cannoli ANYTHING is a huge hit in our house. Adding berries, they will go nuts. You are so creative, I love this! This looks so lovely ! Love that you used ricotta ! Yumm ! Will have to try this !! I love cannoli, but it always seems like so much work--yet this looks amazing and straight forward. I love that you used wonton wrappers for the shell/chips--genius!